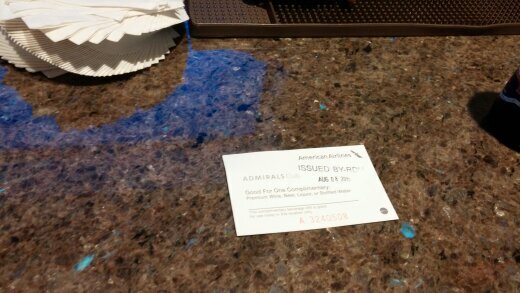 The trip to BOG began with a stop in the RDU Admiral’s Club. Access to the club is by an elevator a few steps to the right after clearing security and descending to the concourse level in terminal 2. 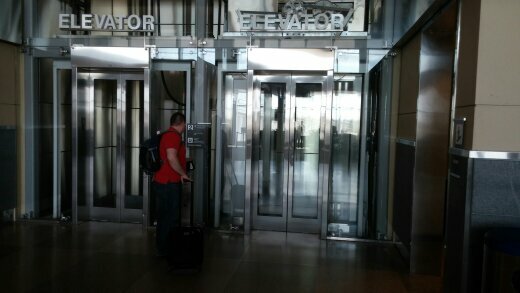 The Admiral’s Club and the Delta Skyclub are both accessed through this elevator. There was plenty of room in the lounge. I found a nice spot that overlooked the concourse, had electrical outlets, and provided a view of the TV above the bar. 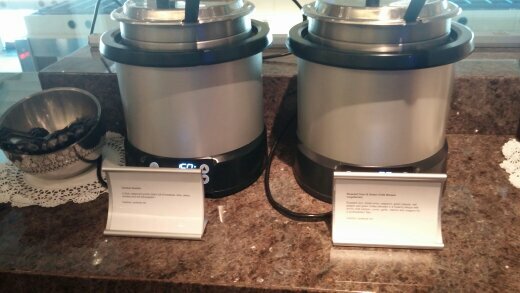 When I entered the lounge,the check-in agent gave me two coupons for premium drinks. I learned that these coupons were due to the fact that I was travelling internationally. This is a nice touch. Depending on the drink selected, the coupons save about $20 and allowd me to enjoy top-shelf liquor rather than the house brands that are complementary. I was surprised to get these coupons since DL does not do this perk for international passengers not even those travelling in business class. The bartender gave me a double Johnnie Walker Black, which was the premium scotch on hand. On subsequent international AA flights I have enjoyed 15-year Glenfiddich with these coupons. I picked up some snacks and soup to go along with the booze. 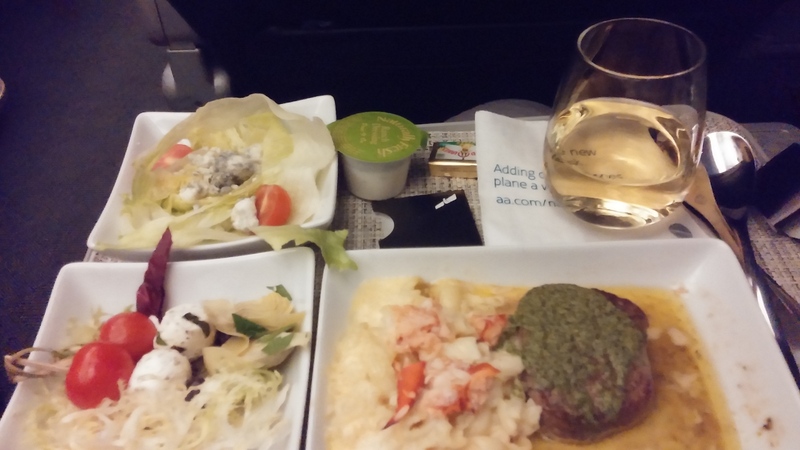 I upgraded the flights to BOG to experience the AA domestic first class and short haul business-class product and service. It was $150 and 15,000 miles to upgrade. 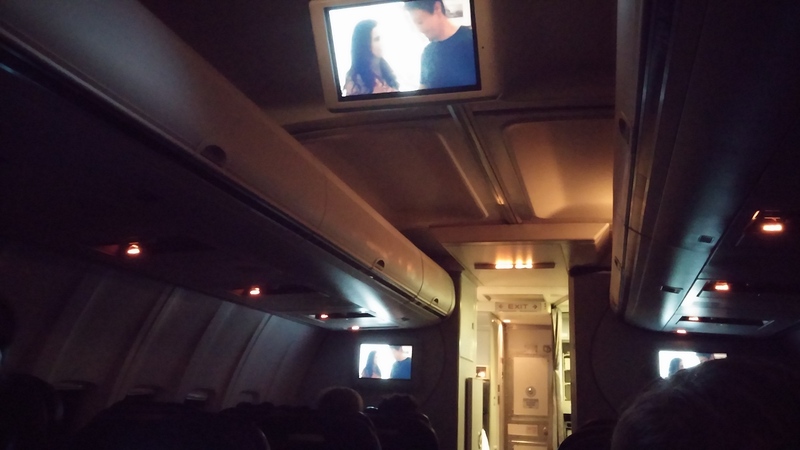 The flight to MIA was on a 737-800. Five of the 16 first-class seats were unfilled. That almost never happens on Delta because all upgrades are complementary. 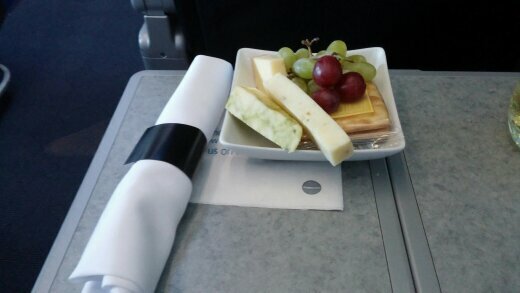 On AA only the top- tier Executive Platinums get complementary upgrades. Platinum and Gold members must use 500-mile certificates that can be bought for $30 each. AA also gives elites four certificates for every 10,000 miles flown. 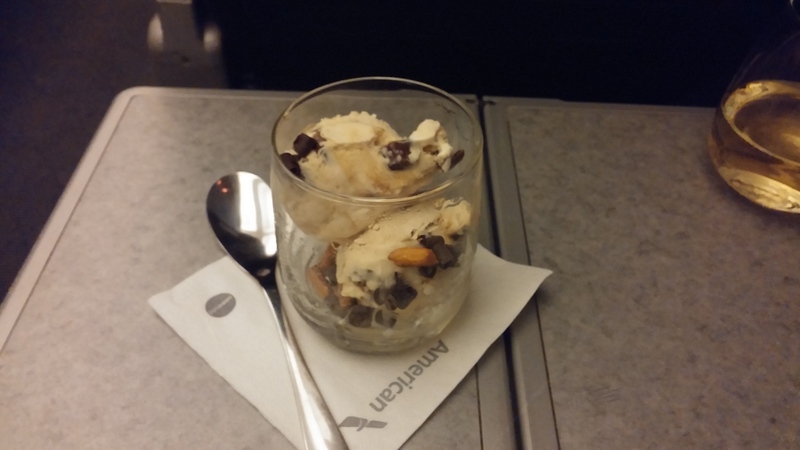 Departing from RDU, the FAs offered a pre-departure beverage to the first-class compartment. There was plenty of time since the flight was delayed because of gate congestion in MIA. 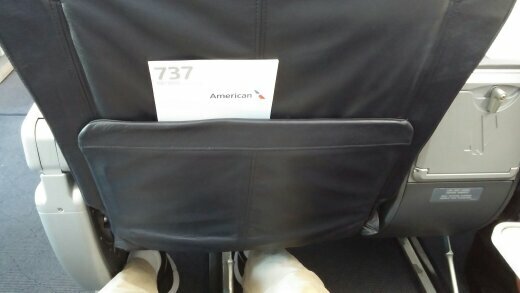 AA domestic first class seats have a greater seat pitch than on DL flights. That means there is more legroom. 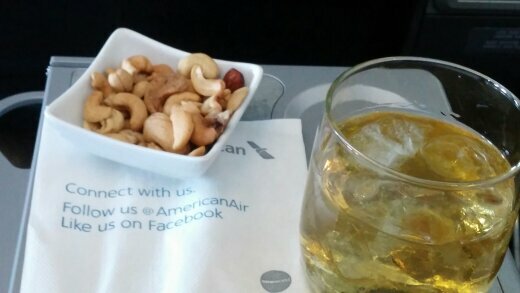 On this short flight, the food service was a light snack that was preceded by warm nuts and a drink. I passed the time by watching American Ninja Warrior on the overhead video screen. The delayed flight meant I needed to go directly to the gate in MIA for the flight to BOG. The first-class section on the 757 was completely full. I had seat 5E. AA provided a pillow and a very nice comforter. This was a diner flight. AA recently improved its meal offerings after complaints about the reduction in meal service that the new USAir management imposed after the merger. The diner was very good and comparable to Delta’s food on a similar flight. 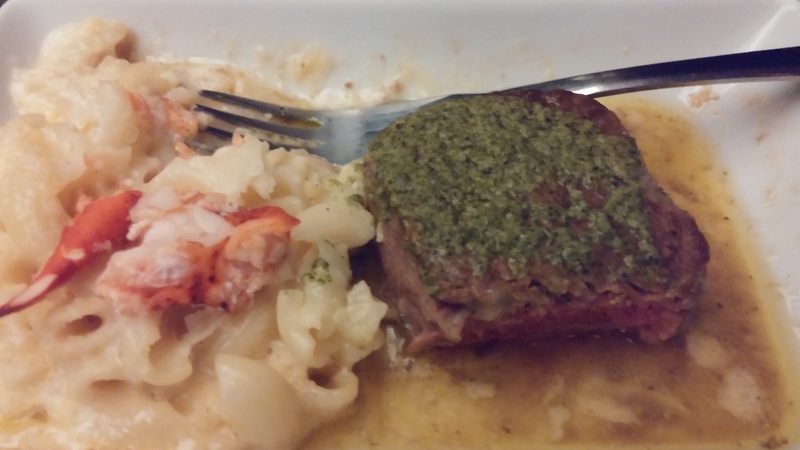 The beef tenderloin was cooked just right and the lobster and macaroni and cheese was superb. 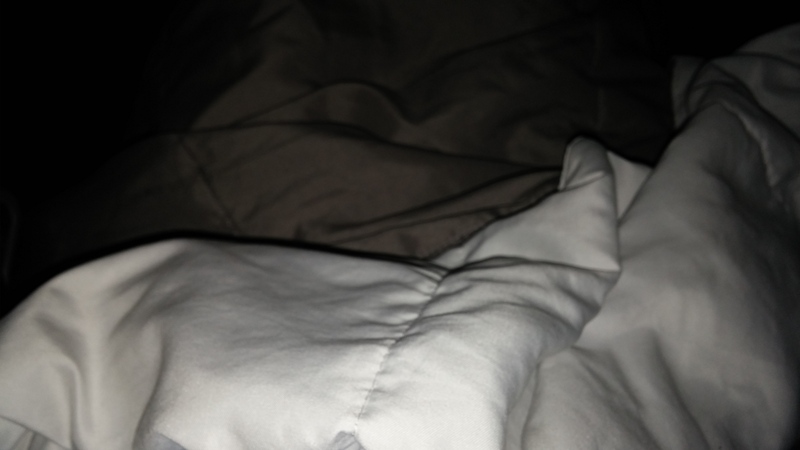 After diner, I took advantage of the comfy comforter and dozed until approaching BOG. The customs forms for Colombia had such small print I did not complete them until after deplaning. BOG has a new international terminal. Once I completed the forms, it was easy to get through customs and immigration and enter the terminal. I changed some US dollars for Colombian pesos and to a taxi to the hotel.